Eh, I didn't realise that it was Friday the 13th yesterday! :o Ah wells, to hell with superstition. So many movies I wanna watch! Ratatouille, because of its 96% on Rotten Tomatoes, the comments in Theatre Hopper, & also word of mouth. 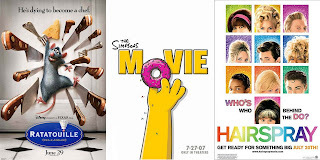 The Simpsons Movie, because it's well, the Simpsons & it's also a movie that Daryl is dying to watch. & I've been quite obsessive about my weight now. O.o I weigh myself like 5 times a day, & freak when I gain like half a kg. I'm trying to get to 39 kg. That's 3.5 kg to reduce.